Snap Band Wrist Watch. The snap band, covered in soft silicon, make an eye catching and practical fashion accessory. 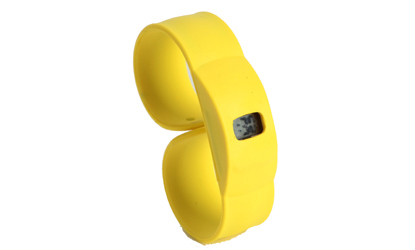 Lovely rubbery feel of this bright and colourful snap band watch is higly tactile and comfortable to wear. The silicon snap band would make a fun lucky dip prize or party bag filler too. Simple to use digital watch with Mode and Set operation to scroll through date and time. The smooth rubbery feel of the silicone snap band and its bright colours make this a great gift idea. Available as a set of 6 or individually in 6 colours.